Miu is a Palomacy rescue that caught my eye when I wasn’t even looking for a pigeon. They’re not popular birds for companionship, but I think it would surprise most people to know how affectionate, emotional, and even entertaining they can be. My history with birds is limited to paired diamond doves and I love their presence, but they don’t like interacting with humans. Imagine my surprise when I saw Palomacy post about a homing pigeon who, despite everything she had just gone through, was tame and friendly. As soon as she arrived at our apartment, she showered everyone with pigeon kisses. Many people may have heard about Emotional Support Animals (ESAs) through stories of strange animals on airplane flights, such as pigs or turkeys. Recently, there has been an increase in websites that claim to certify your pet as an ESA so that they can fly for free. While these websites undermine their credibility, ESAs have a very real and strong impact on people with symptoms of a mental or emotional disability that may not necessarily be visible. They are not service animals and do not require specialized training. They provide benefits through companionship, affection, and their existence. Miu is a Palomacy rescue who caught my eye when I wasn’t even looking for a pigeon. They’re not popular birds for companionship, but I think it would surprise most people to know how affectionate, emotional, and even entertaining they can be. My history with birds is limited to paired diamond doves and I love their presence, but they don’t like interacting with humans. 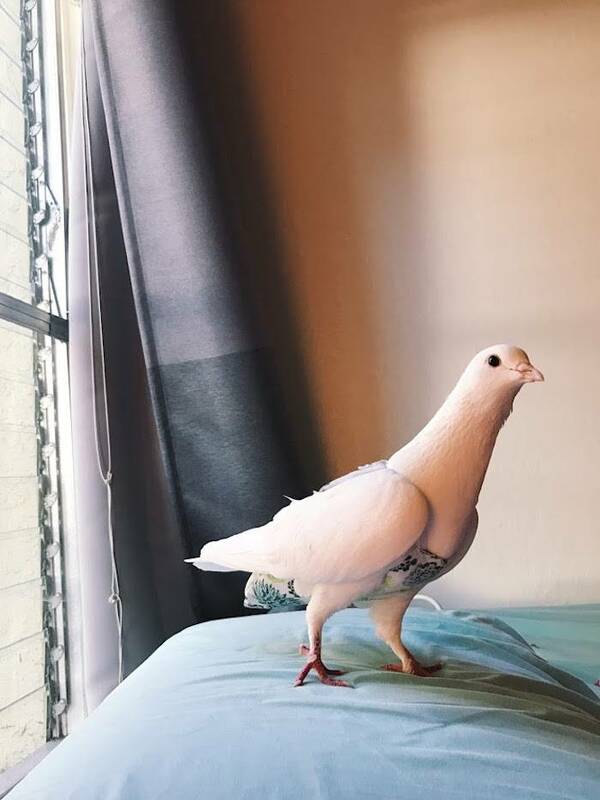 Imagine my surprise when I saw Palomacy post about a homing pigeon who, despite everything she had just gone through, was tame and friendly. As soon as she arrived at our apartment, she showered everyone with pigeon kisses. She came to me at a really low point, and I’d like to be honest about this to show just how much impact her presence made. As a college student, I hadn’t been able to attend most of my classes that semester. I had been spending the majority of my days in bed, unable to find a reason to get up in the mornings and exhausted at the thought of simple things, such as eating or even just walking to the kitchen. I know it’s not something that makes much logical sense, and I was very aware of how illogical this was. I still am – I just couldn’t do anything about it, no matter how hard I thought or how much I wanted to. For me, this is what major depression looks like. The reason that these stories often sound trite or cheesily motivational is because people only talk about it after something changes. I wouldn’t have been able to tell anyone at the time, because time was one long period of staying in a dark bedroom and not much else. Miu was the light for me. She gave me a reason to get up in the mornings, to stay up throughout the day, and the most surprising of all – when I had my first panic attack after she arrived, I locked myself in the bathroom to wait it out and heard flapping wings outside. I opened the door a few minutes later and found her sitting right outside. The comfort that she brings is indescribable. She’s calm when I’m not, she’s something to hold and love even when nothing else appears to be working. She exists. Sometimes all I need is for something to exist with me, and she does that constantly and without complaint. Although she fulfilled all of the requirements for an ESA since she arrived, I decided to get documentation for Miu before traveling home for the holidays. They’re always a difficult time of year, so I wanted to take her back on a flight with me. This involved having a licensed medical professional confirm that she is a necessary accommodation, among other requirements found here. 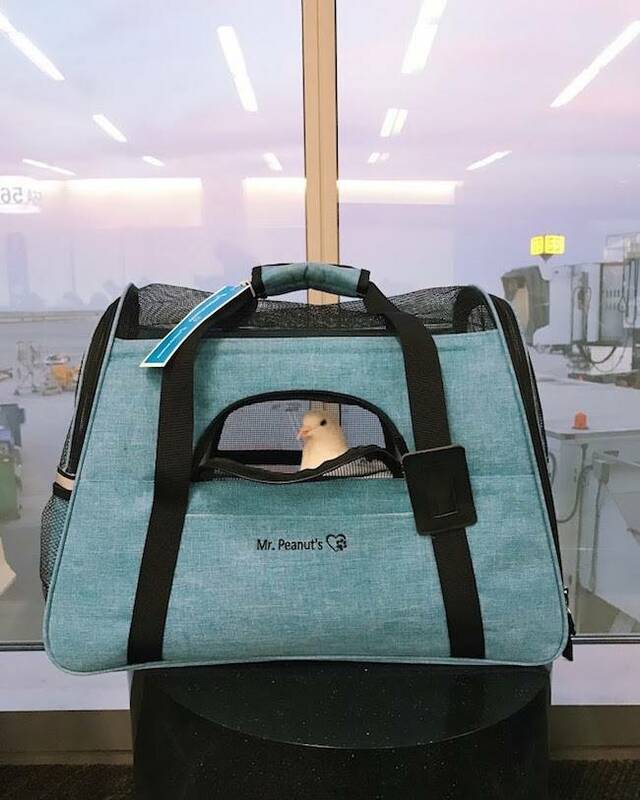 I expected some judgment or hostility from people who may dislike pigeons at the airport, but it is a testament to her gentle nature that the reactions were overwhelmingly positive. Several security officers were delighted when I held her for our private search, and one of them even followed her on Instagram! 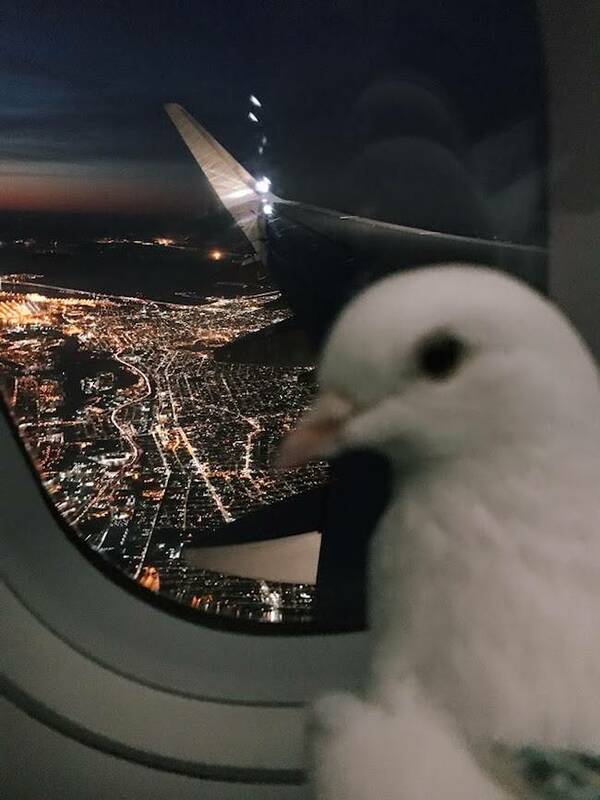 Many people told me they had never seen a pigeon at the airport, and they were delighted at how calm and serene she was in the noisy environment. Young children stared at her with wide eyes, their parents told me she’s beautiful, and a flight attendant even asked me to go to the back of the airplane so she could take a picture of Miu, then a picture with Miu. She told me that she hadn’t seen a bird on her plane in 20 years, and that we absolutely made her day. Through it all, Miu was well-behaved and made many friends both for herself, and pigeons in general. 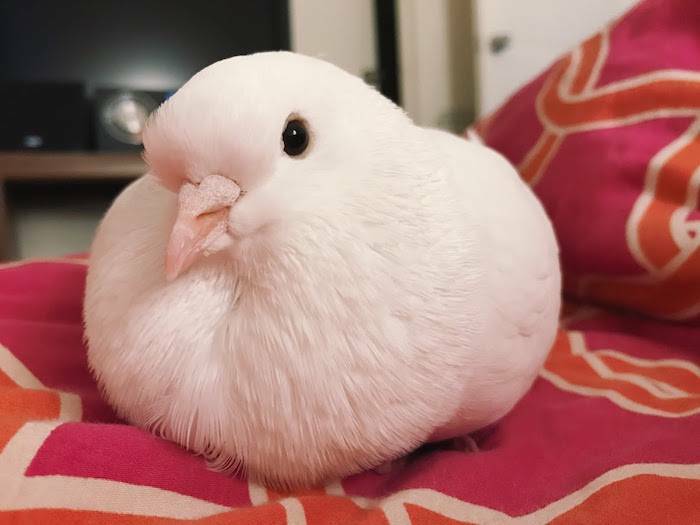 I hope that pigeons are able to gain more attention as calm, loving pets. They make wonderful companions and Miu is such a bright light in my life. She’s helped me more than I could’ve imagined. It may be naive to think that one bird can solve everything, and that’s not what I’m saying – but sometimes, one bird can be the push that begins the enormous and exhausting process of improving. She’s on my side and helping me along, and that’s more than I could’ve asked for from a small, beautiful pigeon. Cynthia is a 4th year student at UC Berkeley, studying Molecular Biology with a concentration in Cynthia is a 4th year student at UC Berkeley, studying Molecular Biology with a concentration in Animal Health. Her claim to fame is living with (and cleaning up after) several Tumblr-famous birds. Despite poor attendance, she managed to get good grades last semester and is still on track to graduate on time. 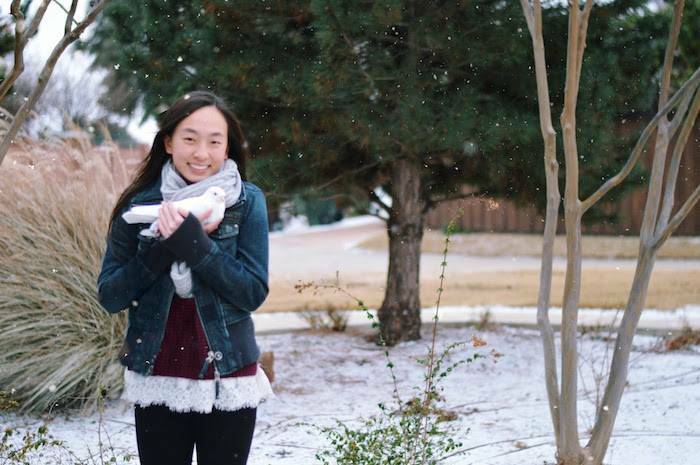 She credits Miu with providing good company and encouragement during finals week, and hopes to dedicate her post-grad life to wildlife rehabilitation and rescue work.